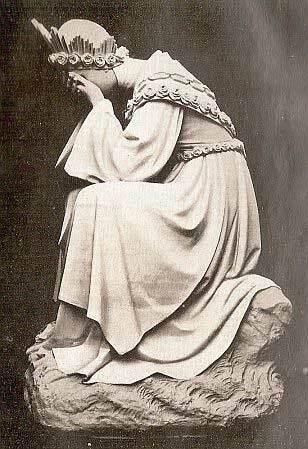 A Prayer to Our Lady of La Salette: For Her Consolation and Ours! 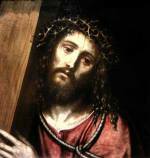 Has our Blessed Mother often wept for humanity? We see her in this picture of Our Lady of La Salette in tears, as she was during her divine Son’s passion, mentioned below. With this prayer we can console her by seeking her help to live lives of holiness. 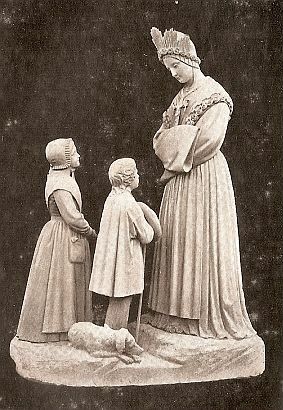 The picture above represents a most unusual apparition in which Our Lady of La Salette was seen by two children Melanie Mathieu and Maxim Giraud, in the small French village of La Sallette, located near Grenoble, on September 19, 1846. She first appeared emerging from a globe of light, weeping over our sins. She continued that far too many people were offending our Lord with their impieties (such as working on Sundays instead of attending Mass) and general disrespect or indifference towards Him. Our Lady of La Salette warned of chastisements that would fall upon humanity if people didn’t change their ways. And indeed, Europe experienced a terrible harvest in 1847 that led to widespread famine there. Before ascending into heaven she urged the children to pray more and gave each of them a secret that was revealed to Pope Pius IX in 1851 concerning threats to the church and to the world. In spite of her sober message, Our Blessed Mother meant for us to have hope in her Son’s Divine mercy, saying “if they are converted, the stones and rocks will change into mounds of wheat, and the potatoes will be self-sown in the land”, and many people soon made amends. In the messages given Melaine and Maxim separately, our Lady of La Salette warned of great upheavals to come in the church and the world if people did not repent of their sins. 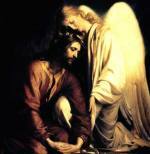 Her words moved Pope Pius IX enough to say of them that "You wish to know the secrets of La Salette? Well, it is this: ‘If you do not do penance, you will all perish!’"
It is important to remember, however, that Mary sought at La Salette not just to chide us but to bring us closer to God. Our Blessed Mother has often been called our “mediatrix” with her Son our Lord Jesus Christ. By virtue of her essential role as the Mother of God in our Salvation, Mary is uniquely qualified to assist us on our journey towards Eternal life. St. Alphonsus Liguori spoke for many other theologians (and popes alike!) when he referred to Our Blessed Mother as “the universal dispenser of all divine graces.” Given our fallen nature, God saw fit to give us His mother, the one human being born without the stain of Original Sin to be our “most gracious advocate” (as she is called in the Hail Holy Queen). 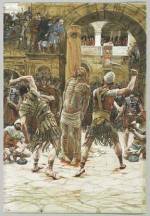 As long as we are genuinely penitent, we can always ask her to intercede with her divine Son on our behalf. And as St. Germanus once noted, Our Lord cannot refuse to grant his Blessed Mother’s requests! Let us take to heart the essential message of this prayer to our Lady of La Salette to keep her close in our hearts as we seek to do Her Son’s will so that we may see her in heaven, as we read above, as we share Eternal Life with Him!